Built in the early fifteenth century, the Jean-Sans-Peur Tower was originally part of a palace belonging to thia Duke of Burgundy. He was a member of the Valois Dynasty and also served as regent for his cousin, Charles VI of France, who was unable to rule because he was mentally ill. Situated in Rue Etienne Marcel, Paris, this tower is the only fortified medieval tower in the city and is now open to the public. It proves a very interesting place to visit. So what is there to see? For a start there is a museum within the tower and this is a carefully planned exhibition that follows the architecture of this area of Paris through the ages. The building is in Gothic style. Within it are a spiral staircase and a famous vaulted stairwell, with hawthorn, oak and hop decor. There is also Jean-Sans-Peur’s room, where he is believed to have hidden from time to time. 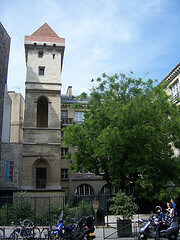 The Duke, also known as Fearless Jean, was eventually killed at this tower by the Duke of Orleans, who was his cousin. Outside you will be interested to see the two walls, the Eglise Ste Eustache and the Halles area. There is plentiful information in a range of languages, which makes the tower and its past very accessible to visitors. You can arrange a guided tour of the building or else walk around at your own pace. Whichever you decide to do, going to this monument will take you back in time and you will really feel the atmosphere of its history. It is well worth visiting. 1:30pm-6pm. April to November: Wednesday to Sunday. November to March: Wednesday, Saturday and Sunday. Last updated by Mary Charman-Smith on 15 January, 2011 in Destinations.